Virgil Abloh was named as the artistic director of Louis Vuitton's menswear earlier this year, and he unveiled his inaugural collection today at Paris Fashion Week. 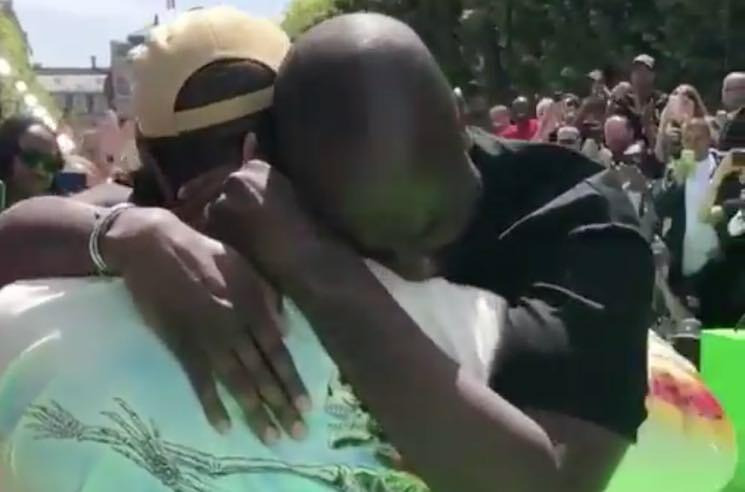 Previously known as the long-time creative director for Kanye West, it's not too surprising that Ye was there to show his support (with family members Kim Kardashian, Kylie Jenner and Travis Scott also in tow). West's recently released ye track "Today I Thought About Killing You" even soundtracked some of the runway walk — most notably as Kid Cudi made his way down the aisle. Other recognizable models in the show included Blood Orange mastermind Dev Hynes, Playboi Carti, A$AP Nast, Theophilius London and the Internet's Steve Lacy. They weren't the only musicians invited to the show, though — Toronto's own BADBADNOTGOOD performed live right up until Abloh made his own way down the runway at the end of the show. See footage from the fashion event below. Kanye West's album ye is available on vinyl via Umusic, as is his Kid Cudi collaboration Kids See Ghosts. The two records also come as a bundle.